A new front entry garden we have just completed in Toorak. It’s on the south side of the building and tucked in between a high wall fence and the house, with just a little snip of north light. 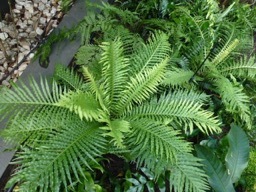 Perfect conditions for a fernery. This is just planted, once the plants start to grow there will be lots of definition between ground cover, low growth and taller specimens, adding depth to the planting.